Welcome to the fifth part of this mini-series, in which I consider lessons we might learn from sports and sports personalities which we can apply to educational ICT. How important is encouragement to Olympic class athletes? I’d like to start off with an admission of error…. I had the pleasure of meeting up with Shelly Terrell and Clive Elsmore (Clivesir on Twitter) recently in Oxford. But look at the text messages we exchanged in order to finalise the arrangements…. Here are a few good reads you may have missed in the last week or so, including an invitation to enter an article for a blog carnival, the deadline for which is this Sunday! When Twitter first appeared on the scene, I thought it sounded like a complete waste of time. But as more and people I respect started singing its praises, I thought I ought to give it a whirl. That was a couple of months ago, and here are my conclusions. I’ve been using the http://paper.li/ service for several months, but a few days ago I decided to cancel it. What is it, and why did I cancel? In these soon-to-be-even-more-straightened times, we all need a bit of light relief. Here's a nice fun thing to have a go at, if you have a Twitter account: the Twitter Parade. The only thing wrong with it is that after a few minutes the 'music' drives you insane. Thanks to Shelly Terrell for writing about this. Many websites have a section in which their current Twitter conversation is shown. I've played around with this myself, and after some time decided that it was not something I wanted to continue with, for the following reasons. Firstly, it just looks so ascetically awful on most websites. Maybe that's to do with broader issues, like the blog's template or the blog owner's design skills, but to my eye it usually just looks like a mess. In fact, there's one blog I checked out recently where the Twitter feed was so prominent that it took me a moment or two to work out where the actual latest article was. When I tried it out I put it on a separate page on its own. That overcame the messiness problem, but it only served to emphasise my second objection. It seems to me that Twitter is, fundamentally, a conversation, and that conversations take place within a context, especially a temporal context. To take a snapshot of a conversation -- which is itself taking it out of context -- and then put it somewhere else entirely, is surely a double whammy? How can that snippet of conversation be meaningful, except by pure chance? Josie Fraser is making an effort to make her Twitter stream more meaningful, and it will be interesting to see how that works out, but I'm not holding my breath. Thirdly, what's the point of it anyway? For me, the idea of Twitter as conversation is that I'd like people to converse with me, not look at what is, in effect, a transcript of a conversation I'm having. Fourthly, when I was trying it out, because I knew that the conversation, or my side of it at least, would appear on my website, I found myself starting to look over my shoulder at myself, which is physically impossible, I know, but hopefully you will get my drift. I would start to think, "How will this look to anyone who doesn't know me? ", and so I began to think twice before I replied with LOL or "Oh no" or whatever. It placed an unnecessary and self-imposed block on my self-expression. Even if all these objections could be overcome, there is a fifth one. This blog is entirely about ICT in education. Maybe that degree of nicheness makes me the most boring person on earth, but that's the way it is. In Twitter and other places, though, I have more wide-ranging conversations. Having those, or parts of them, appear on my blog would serve only to dilute it as far as I'm concerned. You may argue that it would be nice to see a different side to me. I agree that it's always nice to see other dimensions of the people whose blogs we read. The answer is: follow me on Twitter! I'll probably follow you back, and we will both gain. Or read my other blog, where I write about anything and everything, when I find the time. I don't know what the people I converse with are going to say. Most of them, most of the time, don't say anything which might embarrass me, but every so often one of them will swear or imply swearing. If they did so in a comment I would refuse to publish the comment, but I don't have that facility in publishing a Twitter stream (as far as I know). The swearing doesn't happen very often, but I don't want it to appear on my website at all. Finally, this highlights a really important issue. I think one of the things we ought to be teaching young people, and demonstrating, is that we control the technology, or should do. By placing code on your website which puts you, in effect, at the mercy of anyone who, whether inadvertently or not, says something you'd rather not see under your name, you're modelling the exact opposite, ie the technology is in control while you are a passive bystander. All things considered, I think that placing a Twitter stream on a website is definitely a solution to a problem. It's just that I haven't figured out the problem yet. 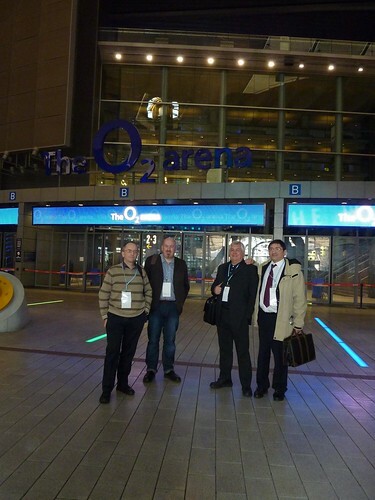 Yesterday I attended the 140 Character Conference in London, where I met up with Bill Gibbon, Neil Adam and Bill Lord. Here are 18 highlights, any one of which could be the start of a rich conversation. I think if you take the volume and variety of the presentations overall, you would have to conclude that any schooling which does not address matters such as etiquette in, and use of, Twitter and other social media is not really a fully rounded education at all. Anyway, here are my ‘takeaways’. I love the idea of Buy A Credit. Donate £1 and you get to have your name listed on the credits of a film. The money goes towards financing said film. What an ingenious idea. @buyacredit. In the eracism slot, Kyra Gaunt told us that racism gives us the opportunity to be courageous. Apparently, one fifth of businesses in the UK are on Twitter. Several people, such as Stephen Fry and the lady from SB Buzz reminded us that Twitter is a relationship channel, not a sales channel. Alex Bellinger told the story of a high street florist which engages its customers with Twitter. The plasma screen in its shop, displaying Twitter conversations, attracts curiosity, and then converts. This would probably be a good tactic to adopt in a school setting, both as a way of engaging other teachers and, on open days, parents. I liked hearing from Dean Landsman and Dean Meyers that an augmented reality system tried out in New York provided the information that, in a particular direction, the nearest tube was 3,000 miles away. This is almost science fiction: think of the great creative writing you would see if you used this anecdote as a starting point. In the musicians’ slot, Manny Norte started a sentence with the words, “M and M comes from an age…” That was only 5 years ago! He went on to say that if M and M were starting out now, he would almost certainly use Twitter to engage with fans, as part of the marketing strategy. I have to say that, in the ‘brands’ session, talk of ‘humanising the brand’ all sounded very cynical to me. Why not just be upfront and admit that Twitter is part of the marketing mix and be done with it? JP Rangaswami, chief scientist at BT, asked why we couldn’t subscribe to a car park’s Twitter feed. Brilliant idea: you’d know which car parks are full in advance. After all, Tower Bridge has a Twitter feed and sends out alerts when the bridge is about to go up. Josie Fraser gave an excellent talk about retweets, followed by some fake stats. I didn’t realise: RTs are a rarity apparently. If you’re a consultant, maybe you miss the buzz and gossip of the office? Federico Grosso suggested that Twitter is actually a gigantic water cooler. Nice idea! Does that mean, then, that home-working is now not only technically possible, but feasible from a ‘human’ point of view too? A question for business studies students perhaps? Some of the more ‘switched-on’ police forces, both here and abroad, have used Twitter to find missing persons and murder witnesses. Chief Inspector Mark Payne explained how using Twitter as a two-way information stream allowed the police to be deployed in the most efficient way during demonstrations, and to keep the public informed of what they were doing, and why. Question for citizenship students: is this a step towards policing with people rather than the policing of people? I was impressed by Ruth Barnett, of Sky, who emphasised the need for integrity when quoting from sources like the ‘Twitterverse’. For example, when covering the recent troubles in Iran, Sky apparently did its best to ensure that the tweeters it obtained information from were people who had already been reporting on it before it became the hot topic. I also thought what she said about the challenges of networking with China was very interesting: they use a different character set and different networks. I’d also add that they probably have a profoundly different world view. All cultures differ, of course, which is what makes all this so interesting and, ultimately, rewarding. Vikki Chowney made the point that, at the G20 conference, live blogging was difficult because of the volume of data being thrown at the audience. Twitter became, in effect, a tool for live blogging. That’s exactly what goes on at many conferences these days, of course. She said that Twitter closed the gap between politics and people. Finally, the author Thembisa Mshaka listed the differences between celebrity and stardom; for instance, a star has a tireless work ethic. She said, in a way reminiscent of Malcolm McLaren’s talk at the Handheld Learning Conference, that mediocrity becomes the order of the day because it is so easy to get away with. Three KS1 classes (aged 5-7 years) will be using Twitter to microblog daily as one of a range of strategies to develop writing. They will also seek to use Twitter to make contact with schools across the world. They will also use Skype later in the year. I met Bill today at the 140 Characters Conference, and his excitement about this project was palpable! Follow Bill on Twitter, where is username is @joga5. If someone follows you in Twitter, the polite thing to do is reciprocate, right? Well, maybe so, but I think it needs a little more thought than that. Here is a list of the steps I take when someone follows me. Incidentally, the same techniques, with a bit of adjustment, work for any social network situation where people can become your "friend". #1: What's in it for you? As a general rule, I think about what I hope to gain from the relationship. Relationship? Yes: as soon as you follow someone, or they follow you, you have a relationship of sorts, whenever you want it or not and regardless of whether you pay it any attention. The only way to avoid it whilst remaining within your Twitter network is by blocking that person. Now, my primary reason for wanting to link with anyone online is my interest in educational ICT. I have a secondary interest, that of business, because I run my own business. I am also interested in writing and journalism. And that is pretty much it. Unless you have the most amazing powers of persuasion, chances are that I won't be your friend or follower unless you come into one of those categories. Yes, there are the odd exceptions, such as connecting with someone who likes the same sort of music as I do, but even there it is almost certainly the case that I already "know" or know of the person through one of the other spheres I have just mentioned. This is very much linked to my main website, of course. The focus of that is ICT in education. There may be a great, newsworthy article just begging to be written -- but if it's not to do with ICT in education it probably won't be me writing it, and if I do, it won't be on that website. What it comes down to is this: I don't want to populate my Twitter network with people who have little or nothing to do with my main interests, because that will only make it more likely that I will miss something important from the people who do. That's why I don't agree with the people who advocate following as many people as possible: I think one needs to be more discriminating than that. In summary: decide in advance what sort of people you're happy to follow, ie the ones from whom you're likely to benefit from following. That's the backdrop against which I take all of the steps that follow. When I receive an email to say that someone is following me, I click on the link to their Twitter page. I then check look to see what they've been tweeting about. If it's mainly technology or education-related, that's a good start. If it's about what they had for breakfast over the last week and a half, that's a real turn-off but not a "deal-breaker". If their tweets are all along the lines of "Great investment opportunity: make $5,000 a week for 5 minutes' work", I will block them straight away. If they haven't tweeted yet, go straight to #5. The next thing I do is check how many people they follow, and who follow them. If they have 3 followers and are following 5,000 people, I probably won't follow them. I would just assume that they're a sort of Twitter groupie and are following everyone in sight. I like to think that they want to follow me because they like what I write about, not to boost their numbers. But I won't dismiss them just yet -- you can't say I'm not fair! If they have 5,000 followers and follow nobody, that seems on the face of it a bit egotistical and a bit pointless. But I still won't dismiss them just yet! If they follow 5,000 people and have 5,000 followers, they're probably some sort of spammer. I almost certainly won't follow them. In fact, I may even block them, because this sort of thing usually goes hand-in-hand with the third type of tweet mentioned in #2. I like to check who the followers are, and who the followees (is there such a word?) are. If I recognise some names I respect, I'm usually happy to set aside my doubts for a while. If it is blank, or says that they're a professional goof-offer, or that they manage a real estate company and enjoy engineering in their spare time, I won't follow them. I have nothing against real estate workers or engineers, but I don't see what any of that has to do with me. See #1. If they don't, I almost certainly won't follow them unless I'm reasonably satisfied according to points 2, 3, 4 and 5. The existence of a website tells me they're (probably) serious. It also gives me a chance to find out more about them. If they have a website, but it's URL is www.goofingoff.com, I won't follow them. If it's some generic website that I can't check, like www.blogger.com, I won't follow them. If we've made it this far, I'll check their website. In other words, unless I have been totally put off according to some of the earlier criteria, and if they do have a genuine-sounding website, I will look at it. If it's interesting then I will probably bookmark it or subscribe to its RSS feed even if I don't wish to follow them in Twitter (just yet). If they have a website, I'll try and find out a little more about them there as well. Bottom line: are they who they purport to be, or some sort of scam artist or pornbroker (no, that wasn't a spelling error)? If all the previous nine hoops have been jumped through satisfactorily, I click on "Follow"! I'd be interested to hear what you think of these steps, and how you respond when people follow you in Twitter or other social networks. Great post from Steve Dembo. Just because you tweet it, doesn't mean to say anyone will 'hear' it! Nice post with good tips. Apologies for posting this link twice: I have been experimenting with Diigo. If you tweet, will anybody hear it? Great post from @Steve Dembo. Just because you tweet it, doesn't mean to say anyone will 'hear' it! Nice post with good tips.